As early as 1955, the ecologist Robert MacArthur argued that the extinction of a sole predator causes the prey population to explode. If there is more than one predator however the decline of one of them might be offset by others thus preventing prey from multiplying to fast. MacArthur, Robert H. (1955). Fluctuations of Animal Populations and a Measure of Community Stability. Ecology, Vol. 36, No. 3, pp. 533-536. MacArthur, R.H. / Wilson, E.O. (1967): The Theory of Island Bioecography. Princeton UP. Elton, C.S. (1958) Ecology of Invasions by Animals and Plants. Chapman & Hall. Other evidence showed in respect to the productivity of a Serengeti plant community that increased diversity may lead to increased stability of biomass (lower variance) in response to disturbance by herbivores. In respect to long-time experiments with prairie ecosystems (11 years) it could be shown that a strong correlation between diversity and robustness exists. However, it can be important to consider the difference of stability and robustness. Flu viruses for instance would be easily eradicated with a vaccine, would their population be just stabile (i.e. always go back to pre-disturbance condition). But flu viruses never reach an equilibrium. Their robustness stems from the fact that they present a moving target. The fight is not against a flu virus, it is against a diverse fluctuating population of viruses. McCann, K. (2000): The diversity-stability-debate. Nature 405. In the 1970, the physicist and biologist Robert May started to suggest mathematical models of randomly assigned interacting populations to show that an increase of populations and of interactions led to less stable (higher variance) population sizes of individual species. May, Robert, (1973): Stability and Complexity in Model Ecosystems. Princeton UP. A much simpler model for demonstrating the effects of diversity has been suggested by Scott E. Page (2011). It considers a forests with three kinds of trees, oak, elm and maples. The forest is afflicted by an oak tree virus, which infects oaks only, and can spread over a distance of 5 trees in each step of time. For visualizing this effect, the model considers the time-line of the forest as running from top to bottom in the following images. Patches of oaks are depicted in green, patches of elms in brighter and patches of maples in darker green. 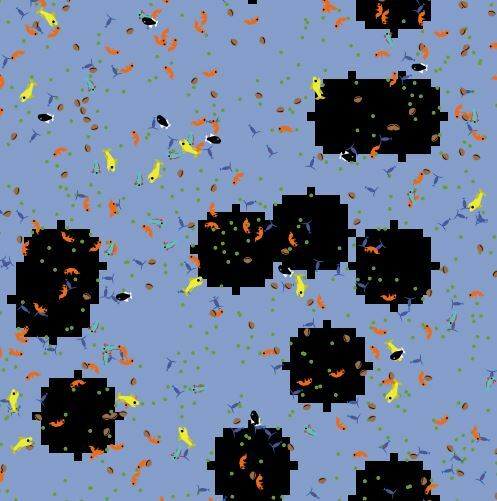 The virus, as yellow dots, indicates the size of one tree patch. In \(t_0\) (top row) there is always 1 oak tree infected, and the infection spreads in each time step (in each row) to neighboring oak trees in radius 5. As can be seen, the only forest that escapes total extinction of oaks is the one in which trees are planted in irregular clusters (forest d). In forest a the virus can spread freely. In forests b and c it spreads even though it has to jump elms and maples at times. Page, Scott E. (2011): Diversity and Complexity. Princeton UP. Another interesting model in this respect simulates the visiting behavior of customers in a bar in Santa Fe. The bar El Farol is open on Thursdays and can accommodate a maximum of 100 people, but it’s really fine if there are only about 60 people around. More people and it gets crowded, less people and ambience is lost. If potential bar attendees uniformly orient their decisions whether to visit the bar or not on the bar-utilization of the last Thursday, huge fluctuations of either too little or too many people in the bar can arise. If people follow divers strategies however, utilization might approach an optimal level. Arthur W. Brian (1994). Inductive Reasoning and Bounded Rationality. American Economic Review 84, p. 406-411. The following images show clippings from a Netlogo-model that simulates aspects of the Lake Michigan Food web as described here. 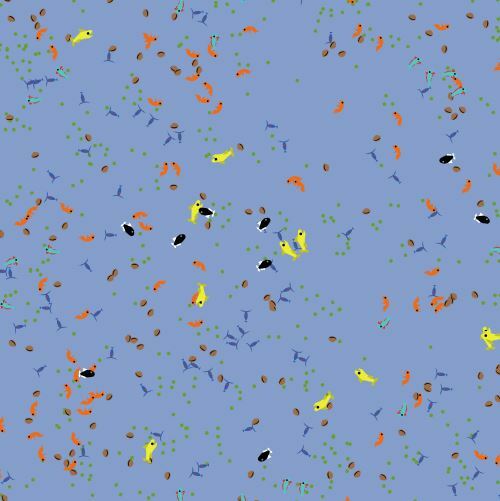 The model is part of a models library that was created by Urs Wilensky and colleagues in the course of the project "Ecological Forecasting: Framework to evaluate the effects of multiple stresses in lake Michigan food web". It illustrates the interaction of predator-prey relationships among several species and is meant to test the effects of diversity on subsistence conditions of species. The model includes possibilities to add rocks to the ecology, as can be seen in form of the black patches in the right image. Predators (yellow and black fish in the image) are not able to access these areas, so smaller species can hide and escape from being eaten. The assumption is that higher proportions of rocks provide more chance for shelter to small species. Too many rocks however impair subsistence possibilities for larger species. 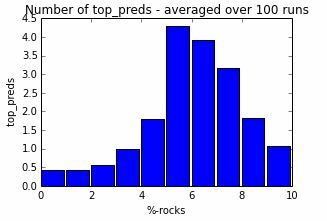 In evaluating this model one could ask therefore what proportion of rocks would optimize species diversity. 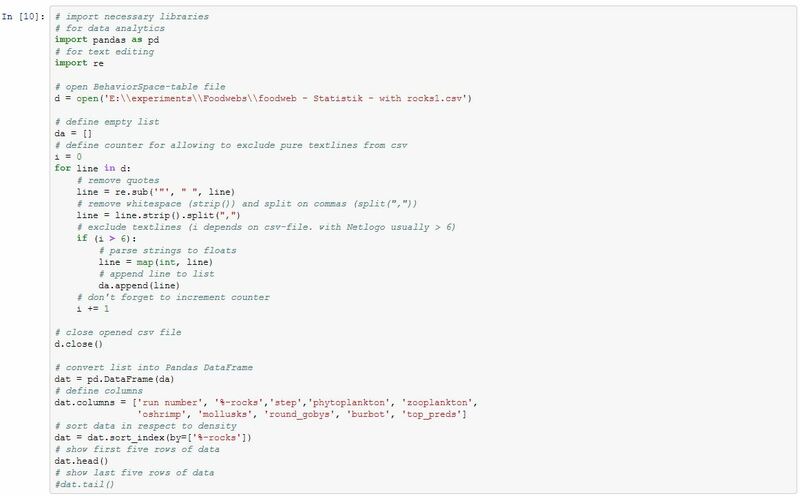 Assuming that this file is saved to the location "E:\\experiments\\Foodwebs\\foodweb - Statistik - with rocks1.csv" on your computer, the following Python-code reads this data, omits irrelevant information, transforms it into a Pandas-format for data analytics and reprints the first 5 lines of data. 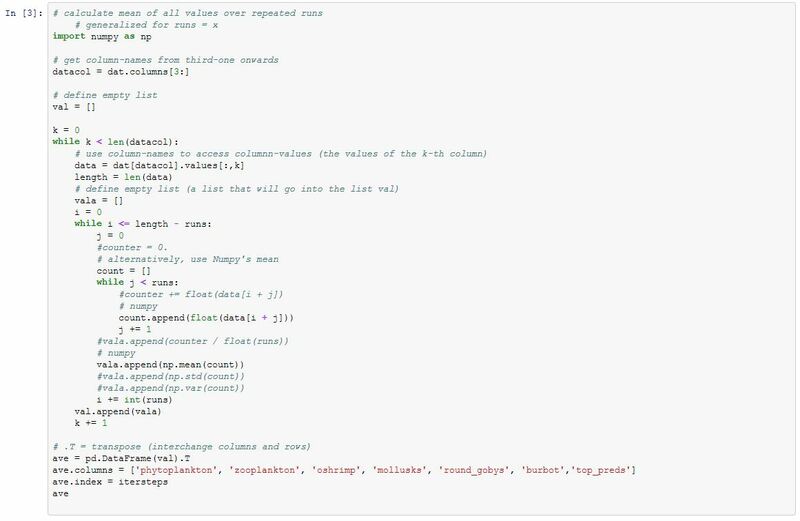 The next lines of code detect how often runs were repeated and excerpt the list of %-rocks-values considered. The following part of the code calculates the mean of the repeated runs. And these lines of code plot the data in comprehensible way. From the plots one can conclude that some of the species-distributions are correlated. So using Pandas' corr-function provides us with a correlation table.